To access this post, you must purchase Quarterly Subscription – Print, Quarterly Subscription – Online, Quarterly Subscription – Print & Online or Quarterly Subscription. 🤔Why did I start The Barefoot Horse Magazine? Well, a few moons ago when I was spending my life bombing around the south west of the UK, visiting my lovely clients with their barefoot horses, we would chat whilst I trimmed, and one of the things I began to realise was that they were so happy I was there…not just to trim their horse but for someone they could chat to who was also a barefoot nut like them. They were often bereft of someone to talk to, or resonate with, or gush to about the trials and tribulations of their barefoot adventure…and this made many of them isolated and feeling alone. It got me thinking during the many hours I spent in my Hoofing van in between visits…what if I could start to bring together all my clients so they could connect with each other? So I started our own private Facebook group. But, people are often fairly shy, and they didn’t always have the nerve to put up posts, and posts aren’t long enough to really tell people about your journey! So, I began to jot down stories and I would send out a newsletter every month to all my clients, telling them about other owners just like them. My clients loved it and they started to feel more connected, stronger and more positive about owning their barefoot horse. NO WAY was my knee jerk reaction – me running a magazine? What do I know about magazines? Besides I am WAY too busy looking after all you guys and trimming your horses to go starting up a mag…. That was 20 issues ago, and we’ve grown and grown. We started as a digital online edition initially but so many wanted to read it in print that we started publishing the printed mags from Issue 6 and they became so popular that the printed editions are now shipped all over the world. I remember how excited we were when the very first printed mags arrived at my house. My kids ripped open the box (yes just ONE box back then!) and the first thing my Mum said was “Oh, it’s actually like a real magazine!” Ha! For those of you who know me, it was never going to be some flimsy pamphlet, nope this mag had to be awesome from the start or not printed at all! We’ve had lots of ups and downs over the years as many of our loyal followers know, particularly lately with changing our data systems and updating our website, but we are now more popular than ever. Our print runs have got bigger and bigger and our hoof print on the equine world, which was once Shetland sized, is now heading towards full grown Cob….maybe we’ll reach a Clydesdale one of these days!! 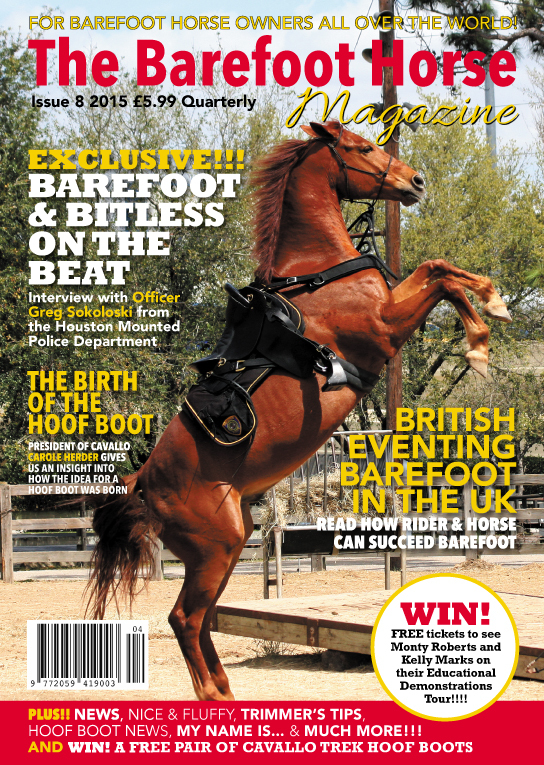 Thanks to all of you who keep on supporting us and a message to all of you who haven’t made that extra step to become a subscriber yet…this mag is for you, it’s a mag you can call your own…because nobody understands about being a barefoot horse owner better than all of us. So, if you haven’t subscribed already, check out this little vid I put together for newbies to the mag….and perhaps those that need a little nudge to get this mag into their lives and on their coffee tables (or to waft in front of your non barefoot horsey friend or vet). You and your horse won’t ever regret it! FREE Calendar with every new Annual Subscription during December 2018! 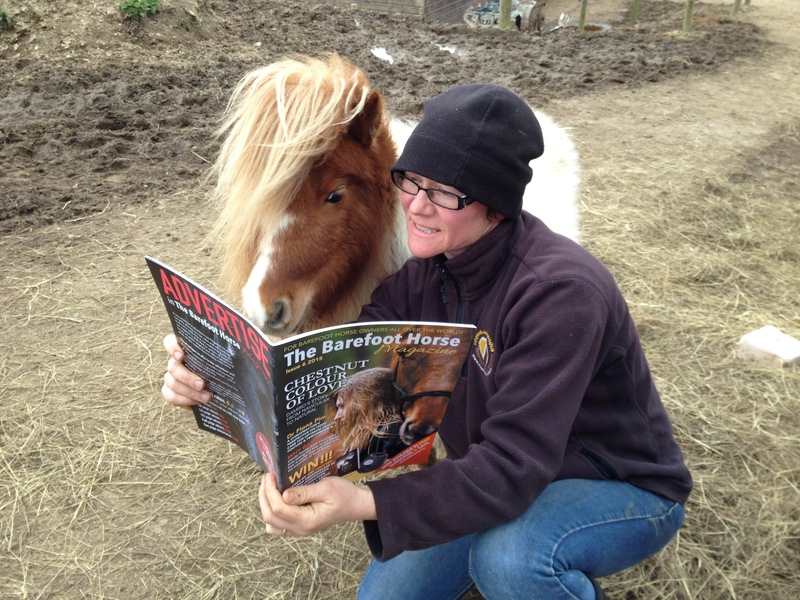 This is the one and only Barefoot Horse Magazine! 🤔🐴Can horses suffer from PTSD? We know horse get stressed. But do we realise just how much stress equines living in our domestic environment suffer? Most of us have witnessed brutal behaviour towards equines at the hands of humans and the effects of such behaviour on the equine stay with them for life. But what about when long term ‘buddies’ are taken away, split up, moved on? This is also a very stressful time for horses and something few humans consider. Horses can begin to become ‘hard work’, maybe they bite, nip, lunge, kick…maybe they hate having their feet trimmed, picked up, touched. Perhaps they hate it when their ears are touched, face, flanks….are ‘cinchy’ with their girths, swinging around to strike when the girths are tightened. Frightened to go into the trailer, stable, yard. Run away and are difficult to catch when they see someone come into their field holding a halter – so the human tries to hide it behind their back. Rip off their rugs, attack other field mates, act like fire breathing dragons going out for what should be a gentle hack. Thousands upon thousands of humans own horses they never ride, are simply too nervous to ride, because their horse, which they adore, is unpredictable and scary out on rides. Some are great in company, others are better alone, some freak out at the thought of leaving their field, friends, yard…..some go to a show once and never again because the stress for both horse and consequently human is just too much. The list goes on and on and on. One thing I know for sure is that many MANY of the above problems can be helped by doing simple things such as changing the diet, the management, taking the shoes off, creating herds, even a herd of two, who live out 100% of the time in more interesting environments where hay is placed in different locations for them to mimic foraging behaviour. Some horses are lucky and have owners who can create these types of environments for them and they become ‘better’ more settled horses because of it. Ulcers are now recognised as one of the most common problems amongst domestic horses in our modern times and it is likely that more horses suffer from them than was ever first imagined! Trauma from living in the domestic world can run very deep and I truly believe many horses suffer from PTSD. Which is why, when I was contacted by a man called Bob Burdekin a few months ago, telling me about his New Wave Therapy Program and how it helps equines suffering from stress, I knew I had to know more. Bob spent most of his life in the horse industry and in 2002 decided he wanted to look at alternative methods to helping horses who had stress related problems, so he could bring about positive changes in their lives. When Bob met a horse called Oden, it made a profound impact on both of their lives. Oden was aggressive, he was a fighter, if you got close to his head he would reach out and bite you, biting the farrier and his owner on several occasions. On finding out more about Oden’s history, Bob realised that, just like the combat soldier, the abused child or the emotionally abused woman, horses too can suffer from Post Traumatic Stress Disorder. His article ‘Can horses suffer from PTSD?’ is a great read and is just one of the typically excellent and thought provoking articles we always have in The Barefoot Horse Magazine and you’ll find it in our latest Issue 20. You won’t find articles like this, written by such knowledgeable individuals as Bob Burdekin in pretty much any of the mainstream ‘horsey’ magazines, which is exactly why we exist. So next time you hear someone complain that their horse is ‘naughty’ or worse needs to be put to sleep because their behaviour is too ‘dangerous’, maybe we need to take a different approach at trying to understand WHY! p.s. the horse in the top picture is Oden with Bob on one of their first meetings. The spotty horse below is one of my horses ‘Tony’ with my daughter Georgia. Before I met him he was aggressive and was heading towards being put to sleep. He came to live with my large herd, out 24/7, eating nothing but good mixed meadow hay, and within 48 hours the herd magic had already worked wonders…I was trimming him on my own with the rope on the ground. Does he still have issues? Without a doubt but nowadays we don’t tend to see them because Tony is one of the lucky ones. Move over Mr Metal Shoe here come the new kids on the block!! As the Editor of The Barefoot Horse Magazine I might be a bit bias, so lets take a look at some of the general pros and cons of shoes vs boots. – Shoes and boots can both come off. If a shoe comes off then the horse is often very footsore and the horse is out of action until the farrier can return. If a boot comes off, other than the fact it has to be put back on again, a barefoot horse has the ability of going bare! It doesn’t matter how many times these points are discussed, there will always be those who believe shoes are better and refuse to believe boots are any good and of course vice versa. However, one thing is for sure, the hoof boot industry is absolutely booming, manufacturers are developing new boots all the time, and therefore that can only mean one thing….the shoeing industry is on the decline. If you want to go barefoot but are worried about your horse ‘coping’, then booting is now a real and better alternative to metal shoes. But don’t take my word for it….we have a great free article for you, showing some scientific research & data, proving without a shadow of a doubt that hoof boots are an improvement on metal shoes. My horse has gone lame…is it an abscess? When you notice that your horse has gone lame, most owners leap to all kinds of conclusions and usually they imagine the problem to be far more sinister than an abscess. Lameness can range from a slight limp to full blown holding the leg up in the air, not weight bearing at all accompanied perhaps with lots of lying down. At the sight of their beloved horse hopping around a field or limping into the yard, or looking like they have broken their leg, and anything in between, can send most unknowing owners into fits of total delirious frenzy. This is usually followed by an expensive (and often unproductive) vet visit and can leave the owner and the horse with days to weeks and even months of recurring problems. How do I know if it is an abscess or something worse? Well 9 times out of 10 if your horse has suddenly gone lame….and the lameness is GETTING WORSE then it is likely to be an abscess. Tendon or ligament injuries tend to follow the path of consistent lameness, not getting worse and gradually getting better. So if your horse is limping about out of the blue and he is getting progressively worse, then you can pretty much guarantee it’s an abscess. There is an awesome flow chart taking your right through how to diagnose an abscess, together with an in depth article all about abscesses in Issue 17 (see link below). Should you call the vet? Ok…well here we have an interesting situation. If a foot abscess is suspected what will your vet do? Vets are deemed to do something to aid the pain your horse is feeling – that’s why you called them right? This can range from painkillers such as Bute (nearly always Bute) to full on digging holes in your horse’s foot. BIG WORD OF WARNING! Digging more holes into your horse’s foot to ‘find and release’ the pus can give your horse instant relief (if the pus is found and it often isn’t) BUT it can also cause far more problems than you bargained for in the long run….and this happens more then you can imagine! The best and most amazing thing about foot abscesses in horses is that ALL horses can deal with them themselves. They can and WILL ALWAYS burst them eventually and another hole in the foot is just asking for more trouble and in MANY cases causes re-infection. Myth Busting!! Does going barefoot cause foot abscesses? NO! But all horses who transition to barefoot from shoes are at risk of getting foot abscesses as their foot heals because the shoeing has caused poor hoof health ranging from holes (yep those nail holes are a wonderful entry point for pathogens), cracks from contraction, and hiding all the other pathology which is due to dietary problems that were not that obvious when the horse was shod. Will my horse get rid of the abscess on his own? – Movement – do not confine your horse…even if it is on 3 legs! – 24/7 Forage – lots of good mixed meadow hay to keep that gut in good condition, remove all sugars – if your horse is loving his grass or molassed licks or molassed feed – then REMOVE IT because that does the opposite of keeping the gut in a good condition, it plays havoc and causes gut problems and that has a knock on effect to the healing of the foot. A horse is more than capable of bursting his own abscess. Yes you want to take the pain away but digging holes and intervention is simply not the most prudent way of going about getting rid of it. Many vets are now beginning to understand this and if they are called many won’t dig….truly it’s not great, it leaves you with a big or bigger hole in your horse’s foot…a bigger hole in your bank balance and the very REAL possibility of your horse re-infecting and suffering months from recurrent abscessing and all the problems that go with that. Look to your diet and management. If your horse is getting abscesses the diet and the management are nearly always at the bottom of it…with the exception of the horse standing on a foreign object! We always have great prizes to win in every issue of the mag. So what do we have for you in Issue 20? It’s another brilliant boot giveaway! Win a pair of CLB Blings! As always folks, see inside the magazine for full details on how to enter – closing date 12th December 2018 so you can get your boots in time for Christmas! There are times, many times, when a ‘non barefoot enthusiast’ utters the disgruntled and immortal words ‘booted isn’t barefoot!’. To this I sigh and smile politely before I deliberate whether or not I should enter into the often lengthy and emotive subject of the difference between bare, booted and shod. Well, as barefoot ‘enthusios’ we know, that there’s nothing healthier and indeed more beautiful than a bare hoof on a horse. Owners often marvel with me, some many months down the line after taking their horse’s shoes off, at just how amazingly different their horse’s feet look ‘now’ compared to ‘then’. But going barefoot is way, way more than just aesthetics. During transition or rehab, on the road to the ‘healthy hoof’, completely going bare may not be possible at that time. This is where the boot comes into its own. Also, in the realms of tough equine sports, such as endurance, where you would think barefoot would be least likely to take off, it’s growing rapidly, aided and abetted by the advent of the boot. Endurance horses often cover great distances far exceeding what they would be apt to do in a natural wild environment and therefore further protection is often needed, take the gruelling Tevis Cup in the US for example, with barefoot & booted competitors year on year taking the tops spots. So boots are a reality. A well fitted boot never impedes the natural hoof mechanism. It is neither invasive nor constrictive. It offers support and protection and affordability. In the UK, a full set of shoes ranges on average from £65-£150 (depending upon your location in the country) every 5-6 weeks. In one year alone that can mean a shoeing bill of well over £1200. Boots range from approximately £85-£250 per pair, depending on the make and size and there is also a thriving second hand market too. It doesn’t take a genius therefore to see that booting your horse is way more cost effective than shoeing, with boots lasting many times longer than shoes….years in lots of cases! This brings me to one of the points of this post. One of the major differences between boots and shoes is that boots can easily be removed, put back on and removed again by the owner whenever they need to. When the horse returns from a ride the boots come off and the hoof is bare. I see so many horses who ride out or work less than 15 hours per week. That means that a vast majority of horses spend 153 hours a week lounging, resting & eating, not being ‘used’ by the human. For barefoot horses that’s 153 hours more contact with the ground than a shod horse in the same amount of work! So this really brings us on to the third option for our horses feet – shoeing. If we further explore the previous calculations of 153 hours a week for bare horses in contact with the ground, most shod horses spend 100% of their ‘useful’ lives in shoes, changing them for a new set or reset every 5-6 weeks. So that’s 168 hours a week no matter whether they are doing work or not…that equates to 8,736 hours a year with absolutely no natural contact with the ground. The owner of course has no control over taking them on or off, they have to wait until the next visit from the farrier (if they happen to stay on that long and not all owners are conscientious enough to change them as often as they should!). Nowadays an even more disturbing statistic is starting to arise. Many more horses now than ever before are spending 24/7, 365, year on year out shod…no rest or recuperation for the hoof. Most people who have been around horses for a long time will tell you that they remember a time when shoes used to be removed at least once a year for a significant amount of time to let the horse’s feet recover. Most farriers encouraged this practice and everyone involved agreed it helped the horse ‘last just that little bit longer’ in shoes. Horses in today’s modern world are often subjected to shoes way before they have fully matured (maturity is approximately around 7 years of age) and are shod ‘back to back’ on just the fronts or increasingly on all four for the rest of their lives, whether they are in work, injured or retired. Even more worryingly now, is the big trend to using remedial shoeing techniques such as heart bar shoes as a ‘preventative’ to problems later on in life…this of course is unfounded and is symptomatic of the backlash to pathology which is wreaking havoc amongst our equines throughout the world. Shoeing ‘back to back’ is something which has become so common that owners are now becoming increasingly afraid of removing their horses shoes for fear of further damage purported by professionals with vested interests and for fear of reprisals from the tongues & prying eyes of their peers! No-one wants to see a ‘footy’ horse tip-toeing across a yard, especially in front of those criticising eyes. But here is where questions need to be asked. Why is the horse ‘footy’? It is often a complete revelation to owners when they are told that their horse’s temporarily uncomfortable state is not just because they have had their shoes removed but because they have actually worn shoes and had a diet and management regime in the past which has caused the problem and deterioration of the hoof health in the first place (not to mention a myriad of other biomechanical issues – but that’s for another post!). So, believe it or not, the future is looking brighter now than has ever been before for our equines. Yes there is huge political controversy surrounding barefoot vs shoeing, not least because there is a great deal of money invested in the shoeing industry and all the subsidiary businesses that support it. Yes horses are going lame earlier and are exhibiting more pathology than ever before…BUT and there is a big BUT… those of us committed to the barefoot healthier horse know that we are amongst some of the most forward thinking and innovative members of the equine community today. We are now able more than ever before, to educate ourselves on the whole health of the horse, instead of relying on tradition and convention to ‘see us through’. Barefoot owners are using their new found knowledge to propel the equine industry kicking and screaming into the 21st century and beyond. Turning their backs on old traditions and conventions which are now finally being scrutinised and questioned and gradually eroded. Mark my words…with barefoot increasing at the rate it is doing today, in the next 10-15 years (or maybe even before) the world will witness a massive swing towards barefoot and booted horses and this will then be seen as the ‘norm’. The shoe, it’s nails and it’s detrimental toll it takes on the hoof and the horse, will be pushed into the annals of history as an interesting stop gap before the world caught up with innovation and educated themselves on the healthy barefoot horse. Happy exciting barefoot & booted times!